(SPOILERS) Colm McCarthy directed the less-than-estimable Doctor Who story The Bells of Saint John, which memorably, in an entirely negative way, featured Matt Smith riding up a skyscraper on a motorbike. While this was in no way McCarthy’s fault, it was suggestive that he had, in some past life, horribly affronted the Fates and would be paying penance via untold degradations for many future incarnations to come. He also performed a stint on Steven Moffat’s increasingly risible Sherlock, before making an appreciable mark on the second series of Peaky Blinders. 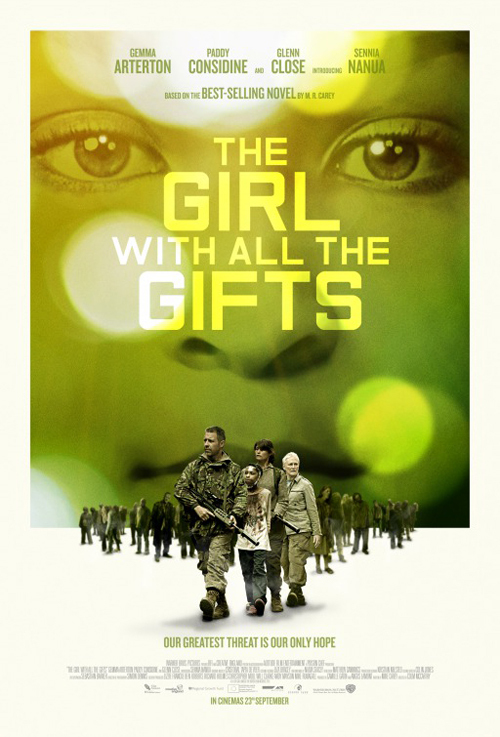 The Girl with All the Gifts is his first since that stint, and he takes to it like a director with something to prove, so much so that, for all that screenwriter Mike Carey’s spin on the zombie genre is unique and distinctive, it’s down to its director and a phenomenal junior performance from newcomer Sennia Nanua that it’s as effective as it is. McCarthy’s subjective lens is with Nanua’s Melanie throughout, but particularly so during the opening section, in which we are introduced to the concrete underground world she inhabits with her fellow detainee children. We see them confined to cells and wheel-chaired to class in restraints, but initially have as little information on the whys and wherefores of this imprisonment as she has (less even). The scenario echoes the doomed subterranean military research facility of Day of the Dead, but rather than a crude, schlocky focus on these child “hungries” who only reduce to the instinctive state of their perma-zombie adult equivalents when roused by bloodlust, it encourages a pointed metaphor for how easy it is to rationalise seeing others as “other”, and so undeserving of our empathy and respect. Indeed, rather than a fleeting or diverting layer of the picture, this is established as the entire point, one that is nurtured all the way through to the final scene; it is no coincidence that Helen (Gemma Arterton in possibly her best performance; it’s certainly up there with Byzantium) survives the fungal apocalypse, the only character to maintain consistent human feeling and decency towards the test subjects. Melanie is able to traverse the various worlds, unconditioned towards judgement of others but astonishingly quick on the uptake in what ought to be new and bewildering situations. 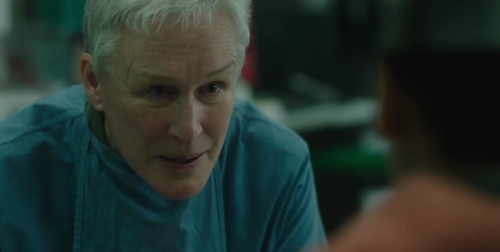 This culminates in her recognition that the price Dr Caldwell (Glenn Close) requests, through her clinician’s eyes, that Melanie sacrifice herself for the (only possible) salvation of a humanity on its last legs, is forfeit. Caldwell is appealing to a one-sided utilitarianism, crystallised for Melanie when the doctor admits that, having spent her entire time rejecting the possibility that Melanie and her ilk are sentient, she is indeed human, and she was wrong. It would have been understandable if Melanie’s decision to spurn Caldwell’s plea was solely about the “Why should we die for you?” (as in, Melanie, having endured physical hardship and verbal abuse, treated as a thing rather than a person, all the time with an eager smile on her face and an unerringly upbeat disposition). It’s a development paralleled by the earlier scene in which she volunteers her own cell number to Caldwell, having realised the “think of a number” game is a means for the doctor to pick the next dissection subject; Melanie would sacrifice herself for a cause, but the cause would have to be just in her philosophy. 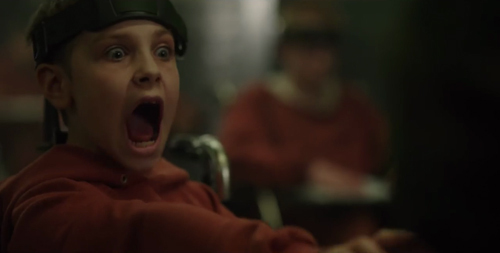 The sequence also provides a basis for her developing authority; the last scene positions her as the leader incarnate of a new civilisation (not too far off from Planet of the Apes’ Caesar), bringing knowledge to the city’s feral children as Helen, from the protection of a sealed lab, provides them with the tools for taking their heritage. Some have seen Melanie’s behaviour throughout as entirely calculated, but I think it reads on several levels. On one hand, her decision to release the spores has a childlike impulsiveness and is imbued with her penchant for storytelling, in that she seeks to protect those who have simply been nice to her in her immediate frame of reference and fairy tale narrative, without any attention to all the other humans she will turn to hungries who might also have treated her fairly given a chance; Parks and Helen will be okay, and that is enough. On the other, it isn’t a decision Helen would have made, but most certainly one Caldwell would have, situations reversed. But of course, Melanie has already shown she is a leader (with the feral kids), and leaders make tough, utilitarian choices for the good of their own. That scene rather justifies a picture that had been losing its way during a rather generic third act. There aren’t very many places a zombie movie can go, even one with as distinctive a starting point (an insect pathogenising fungus that leaps the species barrier) and characteristics (the jabbering, lunging jaws of the infected are a persuasively unnerving conceit), since ultimately it usually comes down to being chased, torn apart, infected and chased some more (if you haven’t succumbed to during the first three elements). While plot and character are firmly in focus, this works fine, through the breach of the complex and the flight to London, even as Melanie is let loose and returns not because she has to but because she likes them (well, Helen and Fisayo Akinade’s Private Gallagher). But there comes a point where characters are required to absent themselves of common-sense for the sake of standard horror film tropes (or, even worse, blundering; at one point Gallagher is sent to find food, and Parks lets Melanie out – to find her own food – within minutes), and you’d rather hoped by this point that McCarthy and Carey (adapting his novel) were above such things. Characters go off alone, enter impossibly tight spaces and then get set upon (and set upon again), having displayed (literally) military precision and discipline earlier. It gets so that when Parks (Paddy Considine) buys it, it’s little more than the writer finding a quick means to kill him off; it’s that ungainly. 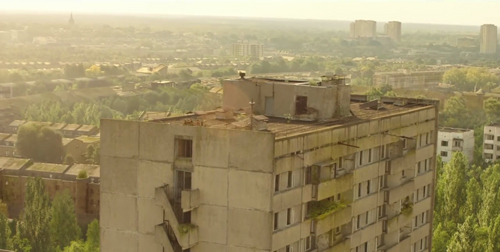 McCarthy uses sound and imagery throughout to marvellously heightened effect, from the unnerving chanting on the soundtrack (Christobal Tapia de Veer also memorably scored Utopia) to the bewilderment of Melanie experiencing the big, bright outdoors (the cinematography comes from McCarthy’s Peaky Blinders lenser, Simon Dennis), to her blissed-out reverie upon feeding. The overgrown London is particularly effective (apparently partially achieved with shots of a Ukranian town deserted since Chernobyl), with readily identifiable shops, insignias and landmarks, and a Day of the Triffids vibe to the ominous seed pods (admittedly, this whole gambit, where a box of matches effectively signals the end of homo sapiens, is a little cute/too neat). It’s easy to come away with the feeling that this desolated human landscape has been justly reclaimed by the planet, well on its way to banishing all traces of civilisation and replacing them with a blanket of greenery. 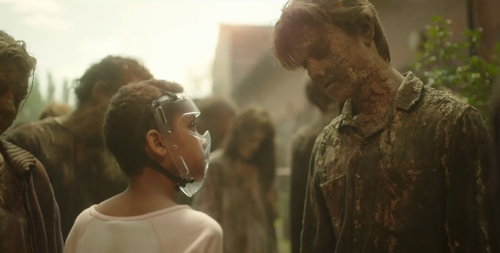 And there are welcome, odd touches, such as the zombie mother still pushing a pram while all around are her immobile brethren (I have to admit to failing to understand the scene of a hungry apparently feeding on his own limbs, however). Considine, Close and Arterton deserve due praise, but Nanua’s almost preternaturally insightful and aware performance is the one to laud most; she’ll surely be at the top of Hollywood casting lists by now. I’m less certain over what McCarthy’s picture says about the current fate of the feline in movies. And I don’t mean being voiced by Kevin Spacey. With this, The Grand Budapest Hotel and Inside Llewyn Davis, the unfortunate demise of the moggy is a development you’d rather hoped wouldn’t be catching on. Like those two pictures, though, an eviscerated cat isn’t enough to diminish its positive points. 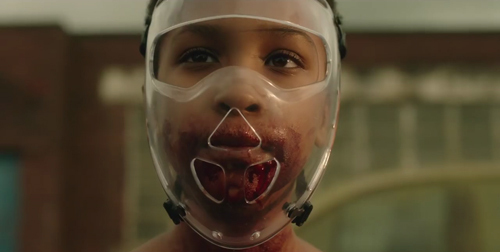 The Girl with All the Gifts deserves to stand out from the ongoing glut of zombie/hungry fare. 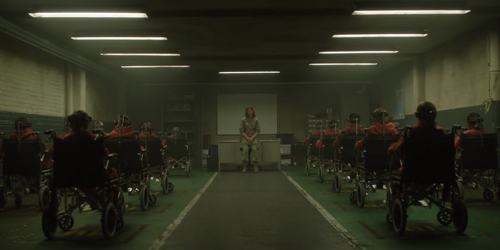 There will be inevitable comparisons to 28 Days Later, but they shouldn’t extend further than that, in both cases, the pictures lose something during the third act; this is thematically a far richer piece.